What do you call a cross between a Frenchman and a stunning reblown glass bottle? The answer is Jean Michel Daluzeau, a master glass artist from Véretz in France whose beautiful creations have won him praise from far and wide. He can also be considered an environmentally friendly advocate and this is due in no small way to the style of his work in which old glass bottles and items are transformed into works of art instead of being thrown away onto some trash heap. A universe of light and transparency has been born from Daluzeau’s creations which allow color to flourish and gorgeous forms to materialise. These new objects thus become new fixtures in the home and for display in art galleries. These might include the delightful flower vases and candle holders or they might address more functional needs that need an aesthetic accompaniment such as tableware, shower walls, thermo windows, lighting fixtures or even fountains. 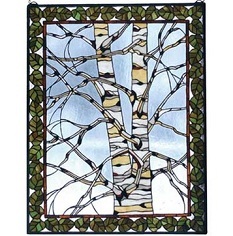 The process of transforming ordinary glass items into works of inspirational art is varied. There are a number of different techniques that go into the development and these include the main philosophy behind Daluzeau’s designs which is the heating of glass to make it malleable and therefore easier to manipulate. This single technique of glass fusion in itself, where glass is formed into one homogeneous state, is nothing new and has been happening for thousands of years. Where the more modern process takes place is the contemporary style that is attained by allowing the glass to collapse and bend under its own weight to form stunning shapes and almost dream-like objects which dazzle with their color, shine and originality. Jean Michel Daluzeau is renowned for pushing the boundaries when it comes to glass working and this can easily be seen in his work. More of which can be discovered on his French-language website found here: La Compagnie des Fontaines. 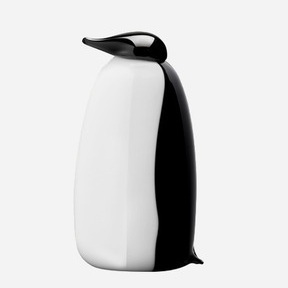 The iittala toikka glass birds are a well known and highly sought after collectors item. 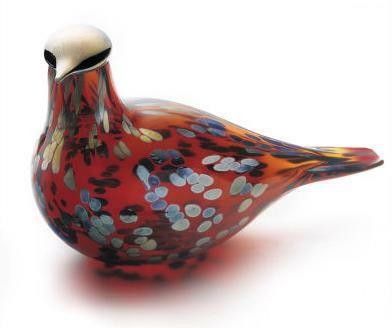 Below is a picture of one of my favourite iittala toikka glass birds, the Ruby Bird, crafted in the famous Nuutajarvi Glass Factory located in Finland. The factory is the oldest in Finland and was founded by the talented glass blower Oiva Toikka whose is the main creative drive behind the beautiful red glass Ruby Bird and many others. How the iittala toikka glassware birds are made is fascinating in itself let alone the marvellously colorful results that can be widely seen. A glass mouth-blowing technique is used to create each individual bird whilst up to five craftsmen work on each glassware piece resulting in a unique design each and every time. The rich colors of the iittala toikka birds are the result of the glass and how it is blown rather than any paint. Finish artist Oiva Toikka of the Nuutajarvi Glass Factory has managed to hone his skills to produce glass art like a painter with a palette. The iittala toikka glassware birds are quite incredible and it’s no surprise they are a collectors item and highly regarded. 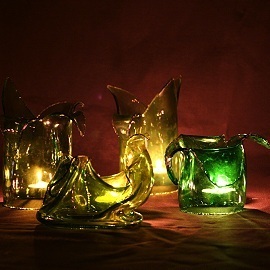 You can read more about the making of these colorful glass birds via the link mentioned below. An iittala toikka glass ruby bird like this one will make a lovely decorative feature in a variety of interior settings. Naturally, a glassware creation which relies on color will go well with a room which is inundated with light, especially natural light. Whether daylight or lamp light, the red glass ruby bird by Oiva Toikka will both capture any light and illuminate the surrounding area with rich patterns and color. Are you looking for an original shot glass set that will take your friends by surprise? If so, then this shot glass set featuring a little pewter man at the base with his arms outstretched will be the perfect drinking accessory. 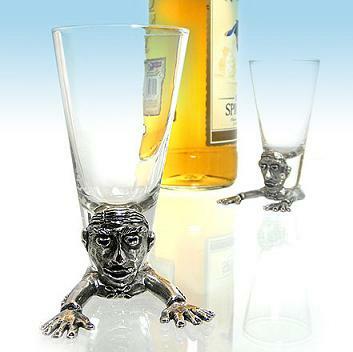 This novelty shot glass set includes two such figurine glasses as seen in the picture below. The shape of the glass narrows at the base, thereby leaving the little pewter figure to act as the stabiliser. Your drinking buddies will be shocked to find that you indeed have extra buddies they didn’t even know about when they set eyes on these amazing little pewter men. The finely detailed figurines are first sculpted in clay before being cast in solid pewter. For a lasting shine, the figures are then coated in nickel silver. These are all American made and are crafted in the state of New Mexico. One need not worry about the metals used in the production of these little pewter shot glass bases. Pewter is a frequently used in kitchenware and jewellery and is safe to use around food and children due to it being completely lead-free. These shot glasses with little figurines at the base will make an excellent talking point during after dinner drinks or at other social functions held in the private home. You can buy this novelty set from the following location: Shot Buddies Pewter Shot Glass Set .